Listening to Rosaria's testimony brought to my mind the poem, The Hound of Heaven. God was running her down and seeking her before she even knew it. Her account of how she came to the Lord is compelling. She talks about how her conversion was a train wreck and that it tore her (homosexual, radical feminist) lifestyle apart. That's what God does! 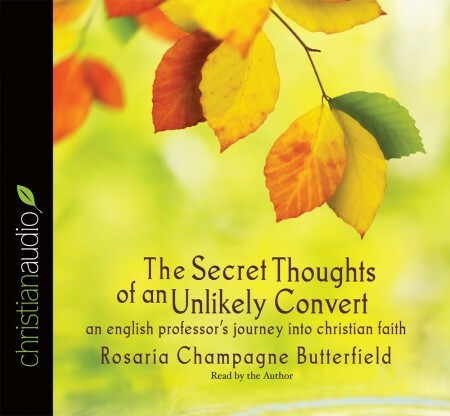 One of the things I liked about this audiobook was her relationship with the Smith's. I learned a lot about Christ's unconditional love and care through them and the way they interacted with Rosaria. God is still in the business of changing lives and hearts! The reason I gave this book 4 stars instead of 5 was the narrator, who is Rosaria herself. I did not care for her style at all. To me, it was very monotone or when she did add some inflection, it was in the wrong place. But that wouldn't stop me from recommending it.